PennsylvAsia: "Journey to Japan," February 18 at Carnegie Library of Pittsburgh in Oakland. 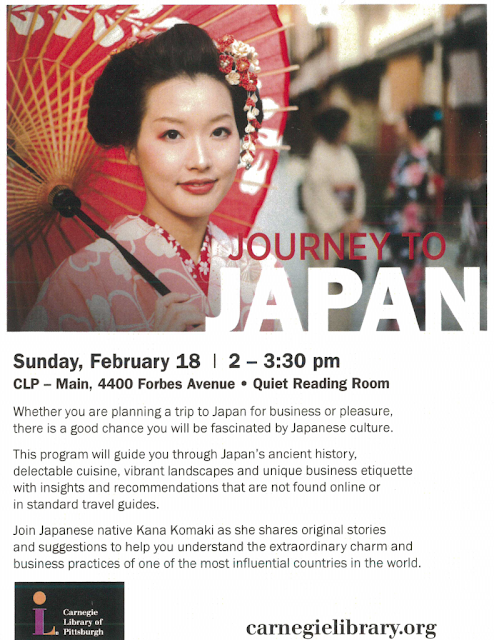 "Journey to Japan," February 18 at Carnegie Library of Pittsburgh in Oakland. The Carnegie Library of Pittsburgh's Main branch in Oakland will host "Journey to Japan" on Sunday, February 18. Whether you are planning a trip to Japan for business or pleasure, there is a good chance you will be fascinated by Japanese culture. This program will guide you through Japan's ancient history, delectable cuisine, vibrant landscapes and unique business etiquette with insights and recommendations that are not found online or in standard travel guides. Join Japanese native Kana Komaki as she shares original stories and suggestions to help you understand the extraordinary charm and business practices of one of the most influential countries in the world. The event runs from 2:00 to 3:00 pm in the Quiet Reading Room and is free and open to the public. The library is located at 4400 Forbes Ave. in Oakland (map) and is accessible by buses 28X, 54, 61C, 61D, 67, 69, 71A, 71B, 71C, 71D, and 93.